I would like to explain how to implement repository pattern before we proceed any further with our single page application discussion. Repository pattern separates the logic that retrieves the data from the database and logic that uses the data by your application. Thus it makes your data access layer independent of your presentation layer. Create POCO class (Model class) with getters and setters mapping to all the properties of database table. Create Interface which list down all the operations we are going to perform on that table. Most of the time we are doing CRUD operation (Create, Read, Update and Delete operation on table). 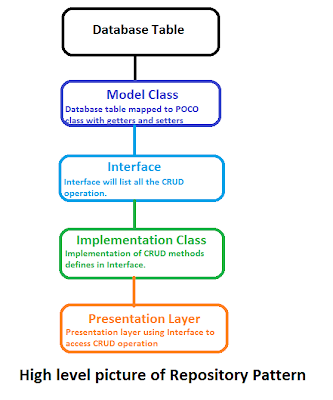 Presentation layer consuming interface to perform database operation. In summary, accessing database through interface is repository pattern. (Disclaimers: Please note I am using few sentence which are very lame in nature just to make explanation as simple as possible for anyone to understand, ones user have good understanding he can judge the things better himself). Since we are accessing database through interface, presentation layer is independent of database layer. That means you can have same data access logic reusable for multiple presentation layer (eg: console application, asp.net mvc, asp.net web form or windows form can use same data access logic.) Similarly whenever you change the way you access data from database doesn't affect how it is rendered on presentation layer. That means if you are using ado.net to access database, later you decide to make use of entity framework or micro-orm or web service or web api, will not require you to make any change on the presentation side. Code will be more maintainable and readable. Flexibility of architecture and much more (Running out of time, so google it please). 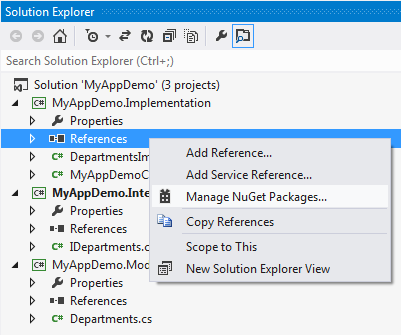 Download Complete Sourcecode for demo discussed in this tutorial for repository pattern. Create a VS.Net Class library project for creating POCO (Plain old CLR Object) class. Create a class called "Departments.cs" and add getters and setters for all table property. 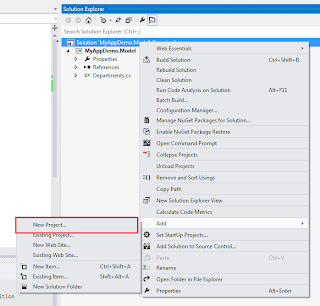 Create a separate VS.Net Class library project for Interface. To do this right click solution file and add new project to existing solution. 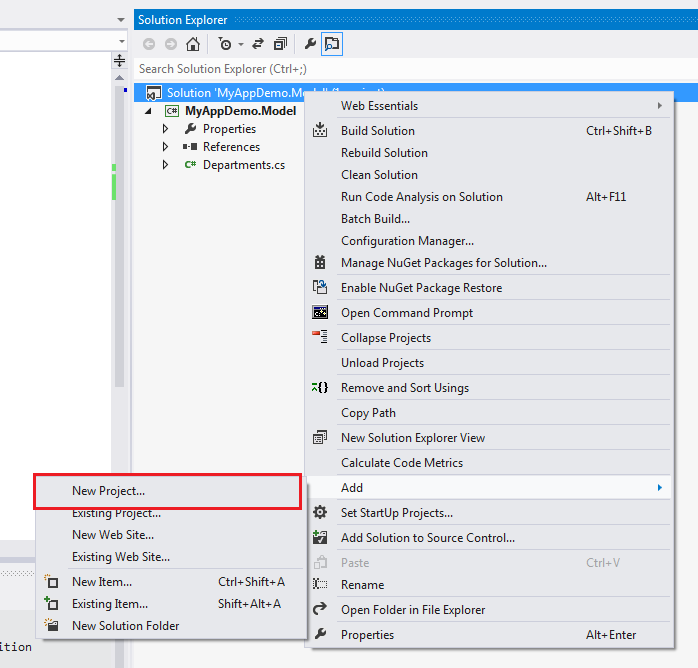 Create a separate VS.Net Class library project for Implementation. To do this right click solution file and add new project to existing solution. Add reference of both model project and interface project into Implementation project. Since for this project I will be accessing data using entity framework. 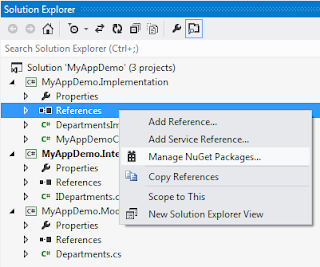 Lets add Entity Framework nuget package for this project. In order to make use of entity framework we will need database context file. So lets first create DB Context file and then Implementation file. Now lets create implementation file. 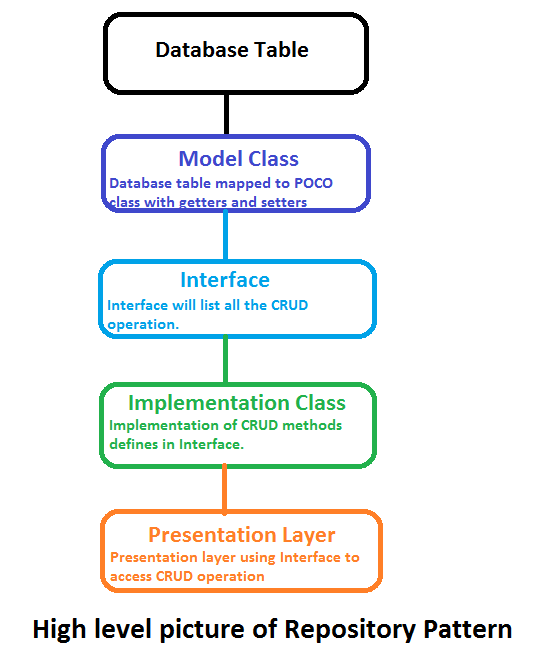 "DepartmentsImpl.cs"
Step 5: Presentation Layer which will be making use of data access layer through interface. Create a separate console project. To do this right click solution file and add new project. Add connection string in App.Config file and following code for making DB listing call to your "Program.cs"
Ones you are done with all the steps your solution will look as shown in figure. 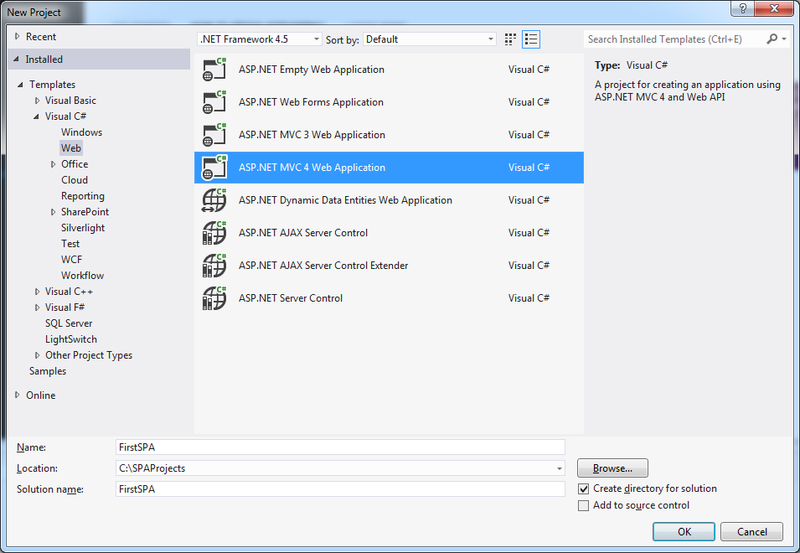 Similarly you can add one more project for Asp.net MVC and use same DB layer. Like any other application HTS is not following default route of having Global.asax as starting point. "I believe" this is not good and there are few other things which "I believe" you won't do it for your production code which we will be going to customize in upcoming blog post. Understanding of above process will be very helpful in customizing Hot Towel SPA template to suits your needs. Adding any more JS support. In next post we will understand how to customize hot towel spa to suits your custom needs. 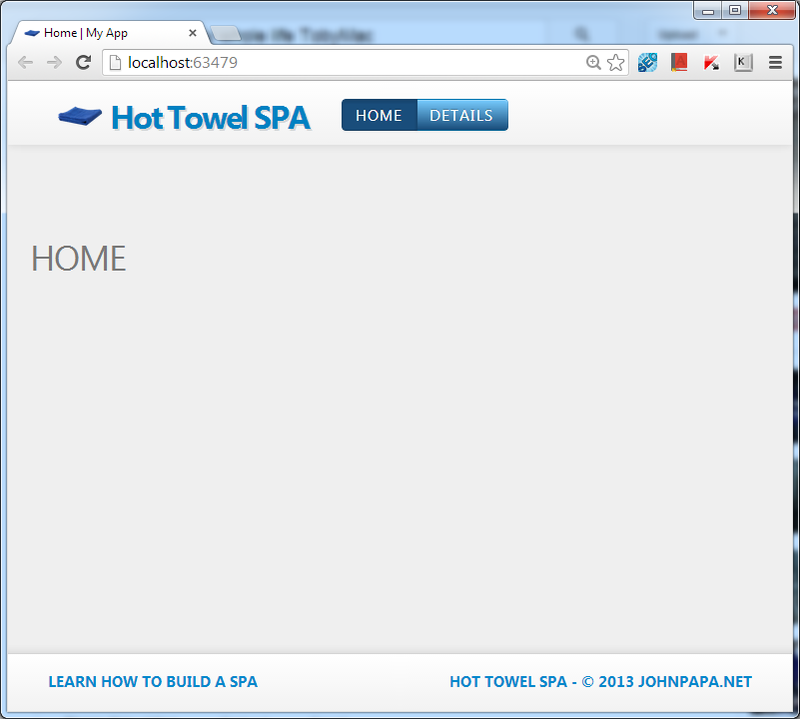 In this post, I will be creating our first SPA application using Hot towel SPA template. If you haven't installed VS.Net 2012.2 Update, then please do it now before reading further. Step 3: Ones your solution is ready, you will notice all SPA related files in App folder. You will also notice that Hot Towel SPA (HTS) has taken care of initial plumbing of installing durandal.js, require.js, bootstrap, breeze, etc. Views Folder - Contains HTML files, it will have plain html code which is used for presentation. Services Folder - Can be used for storing global SPA code which can be shared among all SPA pages. 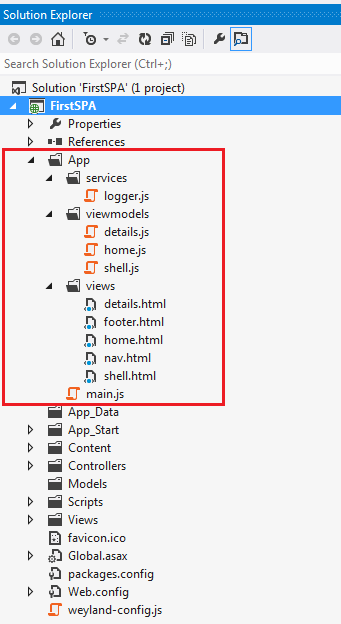 Main.js File - It will contain logic for applying SPA application related settings and starting SPA application. You can then write navigation logic in shell.js file. In next post we will understand, how to perform basic customization to default HTS template. For those of you haven't got chance to work on Single Page Application (SPA), I will be discussing few of my learning in series of post, including how to perform CRUD operation using both Breeze and Web Api. 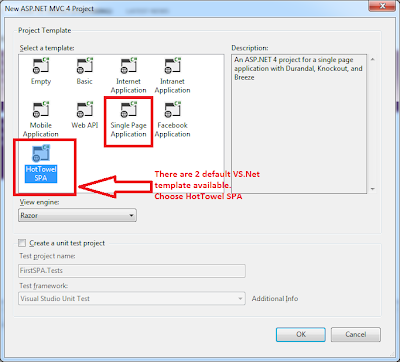 What is Single Page Application (SPA)? SPA application doesn't requires page postback. 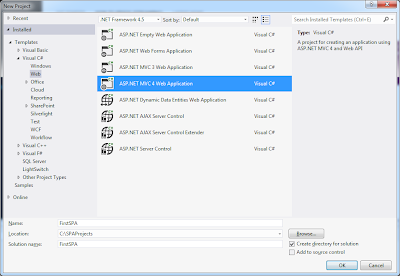 SPA application works very well with web api and it can be used for good user experience (UX). GMAIL is best example of SPA. Before you start any further reading, I would highly recommend to go over John Papa's introductory training video about SPA on Pluralsight. 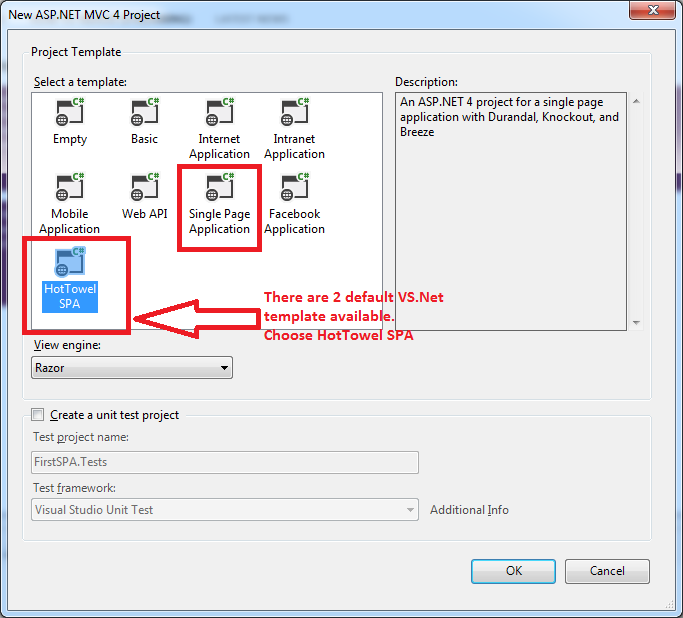 VS.Net comes with default SPA template when you install VS.Net 2012.2 update. However I will highly recommend using John papa's Hot Towel SPA template since it comes up with initial plumbing work for you so that you are get, set, go to develop SPA application. I personally find it is very easy and fast to develop SPA application using Breeze and it is easy to do client side caching of data. 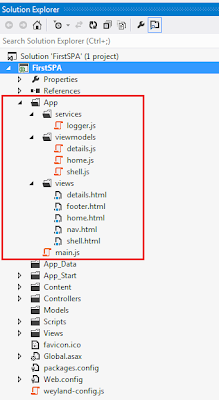 If you are not sure about which route to go, I would recommend you to try implementing Repository Pattern with both Breeze and Web Api and it will make your decision simple. In my whole series I will be making use of Hot Towel SPA Template to create all application. Most of the time when you are working on SPA, if you run into problem. Search appropriately to get quicker solution: For example: If you are facing problem in data binding then search for "Knockout" rather than "Hot towel spa" or "SPA". Similarly if you run into problem for navigation then search for "Durandal", If you are running into problem for CSS search for "Bootstrap" and so on. In next post we will create our first SPA application using Hot towel spa template. If you are in situation where you just want empty database structure, without having data in it. Run following select statement which will generate set of delete statement to delete all the records for all the tables in your database.